Murrayfield Racers forward Aaron Robertson has had his “calender marked” for tonight’s Stuart Robertson Cup match at Kirkcaldy Kestrels. Not only is the 20-year-old Fifer playing back in his home town, but he’ll be facing-off against younger brother, and current Under-18 GB internationalist, Caly. The brothers were team-mates at Edinburgh Capitals last season but with the demise of the city’s only professional team last summer, Caly opted for a return to Kirkcaldy to split his time between Elite League outfit Fife Flyers and the Kestrels, who play with Racers in the Scottish National League. Aaron Robertson said: “I always look forward to playing Fife, especially in my home town Kirkcaldy. They’re the ones I mark the calender for. “I’ve played against Caly a couple of times competitively and it always makes me play my best, not only is he a good player but playing against your brother definitely makes you work harder on the ice. We always push each other every single shift. Racers complete their weekend with a home match at Murrayfield, against Aberdeen Lynx on Sunday (face-off 6pm), again in the Stuart Robertson Cup. 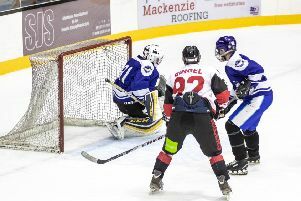 That game will be Racers’ final in the Eastern Conference home and away tournament following last week’s 12-0 mauling of Dundee Tigers, and a 3-3 tie with last season’s SNL champions, Dundee Comets.